Ransomware Protection BlueLink Online Backup for Windows Server detects encryption changes in files and prevents existing backups from being overwritten until an administrator confirms if there is an issue. 256-bit AES Encryption Encrypt your Windows Server backups with up to 256-bit strong keys on source side. All data sent to the cloud is also encrypted using the SSL protocols to protect while it is in transit. Cloud and Local Backup Backup server to cloud storage of your choice or set up local backup if you want to send only a subset of your data to the cloud and keep the rest on your local backup storage. Command Line Interface Get backup plan statistics programmatically and use the Command Line Interface to integrate Windows Server backup with your own routines. 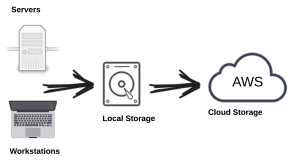 Image Based Backup Block-level volume snapshots are taken and sent directly to the cloud, allowing dissimilar hardware or virtual machines restores. Synthetic Full Backup Reduce the amount of uploaded data and accelerate full backup creation by reusing the existing data stored in the cloud. Scheduling and Real-Time Backup Setup hourly, daily, weekly, monthly backups or specify your own schedule. Real-Time backup allows to backup files and folders on Windows Server on change or creation. Retention Policies Set up retention options to enable automated deletion of outdated data from your storage. Keep only actual versions of your backups. Restore to the Cloud VM BlueLink Online Backup allows to deploy Windows Server image from a backup copy image as an Amazon EC2 or Azure VM instance and get your physical or virtual server up and running in the cloud with a few simple steps. Email Notifications Set up customizable email notification feature to track each run of your Windows Server cloud backup and restore plans remotely. Not sure what is right for you? No problem, we can help you!